Governor Hogan’s plan to build 110 miles of toll lanes on Maryland highways is a disaster for the great majority of Marylanders, and most of all for the state’s middle-class drivers. The plan’s enormous cost will require sky-high tolls. Only the wealthiest drivers will be willing to pay, revenue will fall far short of what is needed to pay back investors and lenders, and taxpayers in all income brackets will get stuck with the bills. Toll lanes that run alongside free lanes are popularly known as “Lexus lanes,” and deservedly so. Simple arithmetic says that if there are four free lanes and two toll lanes (what Hogan proposes for the Capital Beltway), more than two-thirds of the traffic must be on the free lanes — otherwise the toll lanes would be more congested than the free lanes, and there would be no reason to pay the toll. When the free lanes back up, the only reason not to pay the toll is to save money. How badly you need to save money depends, obviously, on how much of it you have, so upper-income drivers predominate on Lexus lanes. Research confirms this common-sense conclusion. How much will the governor’s plan cost? It’s impossible to say, since we have few specifics, but the $9 billion estimate is surely far too low. Transportation Secretary Pete Rahn told the Washington Post last year that just one piece of it, I-270 north of Shady Grove and the American Legion Bridge, would cost over $8 billion. The total price tag could easily reach $30 billion or $40 billion, and it might go even higher. 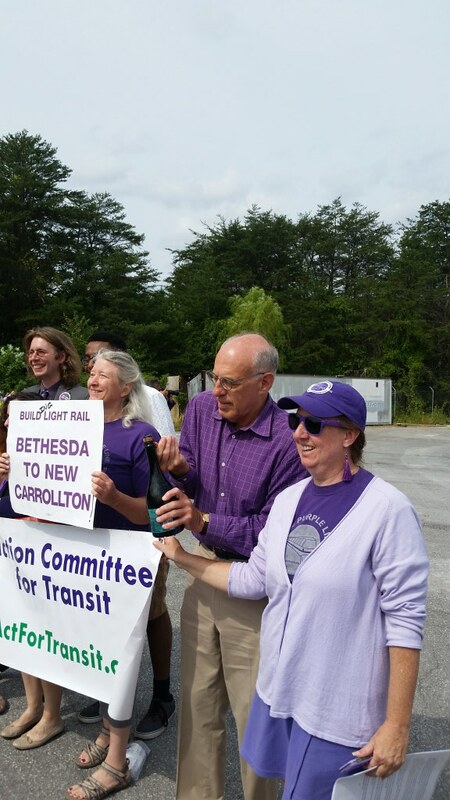 Ben Ross, with champagne bottle, celebrates with fellow activists at the groundbreaking for the Purple Line. Maryland’s only existing Lexus lanes are the 8-mile-long I-95 express toll lanes north of Baltimore, which opened in 2014. The price tag for this project soared from $645 million in 2004 to $1.49 billion in 2009. The O’Malley administration trimmed the cost back to $1.1 billion by eliminating ramps onto the Baltimore Beltway, making the project significantly less useful. Toll collections in 2015-16 were $11.4 million. That’s barely 1 percent of the price of construction, a fraction of just the interest on $1.1 billion, and nowhere near enough to cover operating costs and pay back principal. The Maryland Transportation Authority’s John O’Neill described the building of the I-95 Lexus lanes as “a challenge to coordinate work hours, lane closure schedules, mobilization and moving equipment while keeping the most congested section of I-95 open to traffic.” This challenge will be more severe — and the costs much higher — where the Beltway and I-270 run through thickly settled inner suburbs. Some years ago, the State Highway Administration took a hard look at Beltway Lexus lanes — and SHA blinked. In 1996, it launched the Capital Beltway Study by scanning a wide variety of road and transit options. The transit part of this study gave birth to today’s Purple Line; the highway part continued separately. The only part of the Hogan plan that has a real cost estimate is the section of I-270 between Shady Grove and Frederick. In 2009, SHA calculated the cost of four new Lexus lanes there at $3.9 billion, or $4.4 billion in 2017 dollars. Using this number, we can get an idea of how high the tolls would have to go to avoid taxpayer subsidies. On Lexus lanes nearly all toll revenue comes in rush hour, because drivers aren’t willing to pay very much when the free lanes are moving just as fast as the toll lanes. A pair of express lanes can carry 5 million trips a year if they fill up for 2½ hours a day in each direction. Now, the payments on a 30-year $4.4 billion loan at 2½ percent interest are $209 million a year. Dividing $209 million by 5 million, we see that the one-way toll from Frederick to Shady Grove would need to be $41 to pay off the construction costs alone. A look at the finances of Virginia’s Lexus lanes backs up this calculation. While rising tolls on the Beltway toll lanes already vex drivers, their owners are losing money — even though taxpayer subsidies covered nearly 30 percent of the construction cost. According to Transurban’s financial report for the year that ended in June, revenue of $98 million was less than just the $40 million of expenses and $63 million of accrued interest. Tolls will have to soar before the Australian company can recover its investment and make the profit it expects. The number of Maryland drivers who can afford $40 tolls — let alone the higher tolls that elevated Beltway lanes would require — is far too few to fill up 110 miles of pay lanes. So costs will have to be cut. First to go, as we saw on I-95, will be on-ramps, making the new lanes unusable by local commuters regardless of their wealth. Eventually the entire financial structure will collapse. In all likelihood this will happen long before the whole 110 miles are built out, but taxpayers will be stuck with debt for the highways that do get widened. Chevy and Corolla owners who foot the bills will sit in traffic jams and watch the wealthy whiz by on the Lexus lanes they’re paying for. All three of the governor’s Lexus lane highways run parallel to existing or planned rail transit lines. The Maryland Transit Opportunities Coalition has developed a plan for all-day train service in these same corridors, plus other parts of the state that the governor’s plan ignores, a total of nine counties where four-fifths of the state’s population lives. The Purple Line has now started construction; the estimated cost of Baltimore’s Red Line, light rail down the MD 5/US 301 corridor to Charles County and Southern Maryland, and significant upgrades of all three MARC lines totals $8 billion. This statewide rail network would create far more middle-class jobs than wider highways — witness Marriott’s move from an I-270 office park into downtown Bethesda and Amazon’s search for a new urban headquarters. It would meet the transportation needs of our citizens at a fraction of the price of Lexus lanes for the few, strengthen the foundation for our future economy, and ignite economic investment and jobs growth that will go a long way toward paying for a better connected Maryland. Update: In an October 23 letter to the Montgomery County Council, Secretary Rahn admitted that the state has not yet analyzed how high the tolls would have to be to pay for the Lexus lanes. The $41 figure presented here remains the only credible analysis of the tolls in the Hogan plan. Ben Ross is chair of the Maryland Transit Opportunities Coalition and author of Dead End: Suburban Sprawl and the Rebirth of American Urbanism (Oxford University Press, 2014). This entry was posted in Maryland, News & Articles, Transportation. Bookmark the permalink.